Have Santa’s little elves and helpers become bored with red here, red there, red everywhere? For a little variety, how about a Santa hat for kids made of yellow fleece, hemmed with smart 1" (2 cm) pile faux fur and topped with a 3" (7 cm) diameter pompon? The hat is 16,5" (41 cm) long and has a 20" (50 cm) circumference. 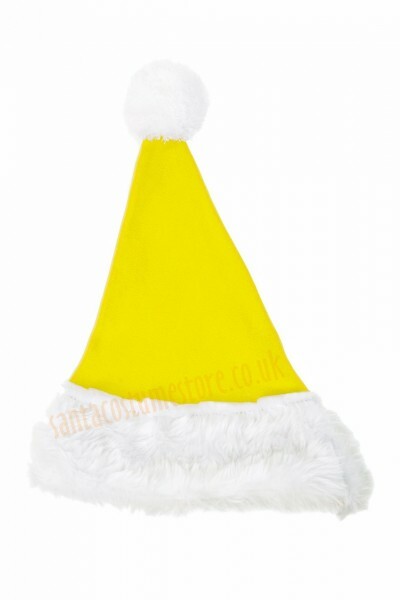 Even the most demanding are bound to be pleased with such a kids’ Santa hat, in a colour of the child’s choice. PANTONE® CODE: In the Pantone® Fashion, Home & Interiors colour chart, this hat's colour is given as 14-0852 TPG. We can embroider any design you want onto our hats. Contact us for a quote. Should you be interested in buying Santa hats or suits in other colours, please contact us.